Awesome markings on this 3 lb rainbow trout from Lake Camp. Photo: Baitman. 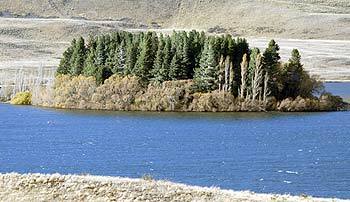 These trout fishing lakes are located in the upper reaches of the Rangitata River about 40 minutes drive from Methven. There is a small village of about 100 baches built on the high ground that separates the two lakes. There are also elementary camping facilities available on the lake shore near the baches. It is just a two minute walk from one lake to the other. 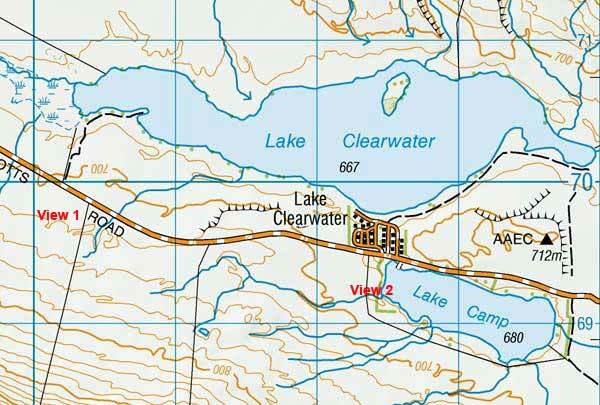 Lake Clearwater is approximately 4 km long and 1 km wide. It was dicovered by T.H Potts and Henry Phillips in 1857 but its location would have long before been known to the Maori. Powerboating is not permitted on Lake Clearwater but is permitted on the smaller adjacent Lake Camp. Baches at Lake Clearwater – many of which have been owned by families for generations. Sadly owning a holiday bach is a part of New Zealand life that is steadily ebbing away. Fly and spin fishing is permitted on both lakes. The limit bag is two trout. The fishing season opens on the first Saturday of November and ends on 30 April. There is no winter fishing season in any of the Ashburton lakes except Lake Camp which opens during the month of May. These lakes can, and often do, completely freeze over in winter. Most anglers fish Lake Clearwater and Lake Camp from the shoreline. Recommended spinning lures include: Black and gold Toby 12 g, No.10 Johnson’s Fishtail Kobra, and Green and Gold Tassie Devil. Small island in Lake Clearwater. On the fly rod you can’t go past a Hamill’s Killer or a Mrs Simpson (green or red). Favoured dry flies include: Coch-y-Bondhu, Love’s Lure, Green or Brown Beetle, and a Cicada trout fly pattern in summer. These lakes are very exposed to the weather and the howling nor’west wind in particular. They can be challenging to fish in still calm conditions. At such times it is essential to cast in front of a fish as it patrols its beat. The aid of a mate to act as a spotter is also helpful. 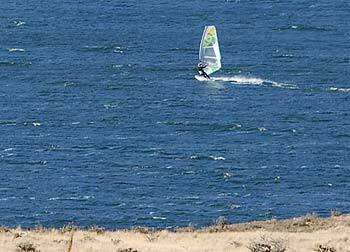 Windsurfing and kite-boarding are very popular on Lake Clearwater. Harling and trolling from a rowed boat is also popular and effective on Lake Clearwater. Fishing from boats is prohibited in Lake Camp. An olive green or brown Woolly Buggar is a top producer when harling on these lakes. But great care must be exercised. These exposed lakes can become rough very quickly once the wind gets up. It is always better to stay close to the lake edges and avoid the middle of the larger lakes for just this reason. Kayak fishing continues to grow in popularity on Canterbury’s high country lakes. It is a relatively inexpensive form of boating and is well suited to these smaller lakes where power boating is not permitted. A kayak is easier to transport on the roof of a car: and is easier to drag from the car to the water’s edge than a more traditional fishing dinghy. A kayak or dinghy makes it possible to access parts of the lake that are otherwise difficult to get to on foot. 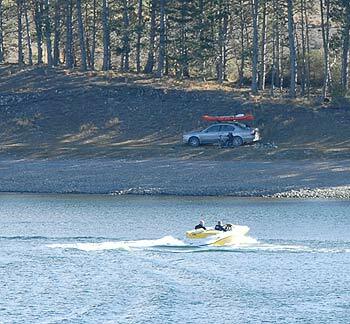 A speed boat on Lake Camp and behind it a car with roof-mounted kayak. In my view the kayak is more useful for fishing the smaller Canterbury high country lakes – provided proper care is exercised. Rowing or paddling also provides just the right speed for a trolled lure. You can also mount a small electronic fish-finder on both craft so you’ll know where the fish are and how deep the water is! A kayak doesn’t spook trout in the same way as a noisy speed boat so you have a better chance of sneaking up on the fish. But as mentioned above great care must be exercised when boating on Canterbury’s high country lakes. Always wear your life-jacket no matter how calm the lake surface may be. It is also best not to venture on to these lakes in your kayak alone if you can avoid doing so. At over 600m above sea level it can get very cold at night even in high summer so be sure to take plenty of blankets and warm clothing if camping in a tent. Driving time from Christchurch City to Lake Clearwater takes about 1 hour and 45 minutes. Past Hakatere Corner the roads in the area are gravel. View eastward overlooking Lake Clearwater from Hakatere Potts Road. This is View 1 on the map below. The vast and barren landscape is perhaps more picturesque when covered in winter snow. View looking east over Lake Camp – View 2 on the map below. This small lake is the only one in the Ashburton group where power boating is permitted. There is plenty to see and do on and around the Ashburton lakes for those who enjoy the outdoors: Mountain biking, photography, fishing, tramping, kayaking, mountain climbing, walking, wind-surfing, kite-surfing, bird-watching, and on Lake Camp water skiing. The vast Hakatere Conservation Park is a wonderful place to visit for the magnificient grandeur of the Canterbury high country landscape. Most of the lakes are shallow and quite small. They warm up in summer and freeze over in winter. They are mostly wind-swept and very exposed to the elements. Spotting and stalking trout can be challenging. As mentioned a kayak or dinghy is a considerable advantage to the determined angler. A rough surface on Lake Clearwater from the howling wind. There is a very basic camping ground on the lake front at the right of the picture. The charges are just $4.00 per night. No power and no dogs. No empting campervan waste either. You must take all your rubbish back with you as well. It is just 2 minutes walk over the rise to the left of picture to Lake Camp.